What do people look at in fountain pen brands? What makes a particular brand the best? Some people look for writing quality, while other look for smooth ink flow. Some are interested in longevity while others are interested in the look and feel of the pen. Others are concerned with the price and the standard of the brand. The following fountain pen brands are rated highly in all of the previously mentioned categories, even by the most hardy connoisseurs of fountain pens. If you’re unfamiliar with the area, then, and you are looking to buy a fountain pen, you can’t go very wrong by picking a pen from any of these companies and their established fountain pen brands..
A European brand, this is a favorite because it makes wonderful pens that do not dent your bank balance. Lamy was one of the first companies to use plastic to make their pens, and they owe their fame to that as well as their current quality. Designed to keep working no matter what you do to it, they make great starter pens because of their cheap price. This German brand has been around for a long time as well. 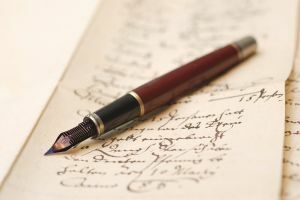 This also makes affordable pens with a characteristic buttery smoothness to the writing that their loyal customers and regular users find extremely enjoyable. Established over a century ago and perhaps the most famous of all the brands. Parker has been making high quality pens for a very long time. Parker pens are known for their reliability and long life. In recent years, Parker pens has made an effort to increase their affordability, with reasonably priced pens available as well as more expensive ones. This allows for beginners to slowly work themselves up the ladder, starting from simple and cheaper versions and later on graduating to the fancier varieties, without having to switch brands. Founded exactly a hundred years ago, in 1913 in the U.S. This company is now owned by Bic. Sheaffer pens are both beautiful to look at as well as to use. They have a wide variety of designs, both in the barrel as well as nib sizes, so it’s not difficult to find a design that you’ll prefer. Like Parker, they are a globally renowned brand that makes pens that are high-end as well as many that are reasonable and affordable. Waterman pens are best known for their long history (the company was founded in the 1800s) and for their inventor’s patent of a feeding mechanism for ink. Waterman pens are also very distinct from one another, instead of being iterations of the same design. They are aesthetically very pleasing, especially their gorgeous nibs. These beautiful pens are total luxury items, and the price reflects that. They are valuable pens, whether vintage or more recently manufactured, and they have a resale value much higher than other pens. In addition, the brand is extremely well-known, so if you’re looking to flash your classiness, this is a good choice. Even more importantly, the pens are simply glorious in appearance. It’s hard to not want a pen of such magnificent beauty and attention to detail.